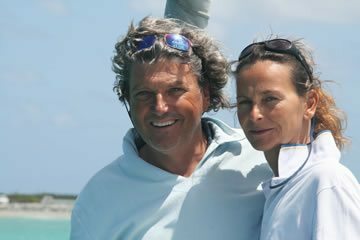 We are Eugenio Favero, skipper, and Paola Brocca, hostess. We are very glad to welcome you on our sailing boat, Penelope 1, for a restoring sailing vacation with us, where you may relax, enjoy yourselves, taste gourmet food and discover enchanting stretches of spectacular nature. During our sailboat cruises you may take the opportunity, if you wish, to learn how to sail. Our sailing charter programs have been created with careful attention to your different needs and desires, so that you may pick the charter which meets your requests and, most important of all, you will be free to choose the way in which to spend your sailing vacation. 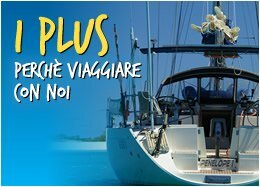 flexible embarkation possibilities, to suit all needs: if you are not yet part of a group, you may choose our INDIVIDUAL EMBARKATION FORMULA, and book your sailing vacation independenlty. If you already form a group, you may choose our GROUP EMBARKATION FORMULA. reasonably priced programs, as shown in our sailing vacation charter schedules. customized programs. In addition to cruises shown in our sailing charter programs, we may provide cruises "cut to measure" for you, in order to meet your needs. you may also charter our sailing boat in EXCLUSIVE USE. programs to suit couples, singles, families with children, and for all ages. You will always find a warm welcome and careful professional hospitality. programs to suit those of you who never had sailing experience and/or do not wish to take sailing lessons. You may decide to spend your vacation by relaxing and “dolce far niente” (the beauty of doing nothing), or seize the opportunity to learn sailing skills and carry out practical sailing manoeuvring. It will be up to you. programs to suit those who already had sailing experience and would like to improve or enhance sailing skills. 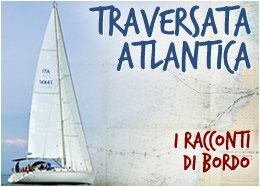 In our schedules you will also find deep sea sailing week charters and a particular, unique kind of charter, which will let you experience strong emotions: THE ATLANTIC OCEAN CROSSING. programs which take place at different times of the year and in different places: Croatia, Sicily, Sardinia, Balear Islands, Canary Islands and Caribbean Islands. Different places which all offer different types of breathtaking wonders: mosaics of luxurious nature, streches of immaculate coasts, cozy harbours, crystal blue waters embedding charming islands...all you have to do is choose! 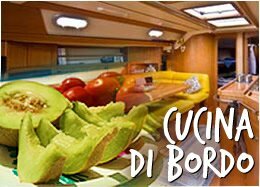 particular attention to gourmet cuisine.. You may enjoy your sailing vacation tasting delicious specialities, choosing between creative cuisine or traditional food...or both. For informations and booking office you may contact me, Eugenio, at (+39) 335 5460 160 or mail us to info@crocierevelafavero.it / eugeniofavero@gmail.com. On the frequently asked questions page you will find answers to recurrent questions, along with useful advice for your comfort and wellness during your sailing vacation. We do look forward to welcoming you! 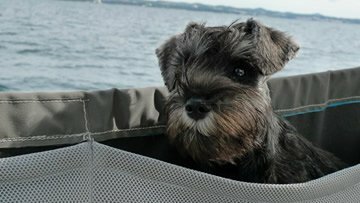 We will be very glad to lead you through your sailing vacation, so that you may enjoy comfort and good company, surrounded by friendship, good wind and spectacular nature.